The New Jersey Department of Transportation took down hundreds of campaign signs from three highways that run through the city. 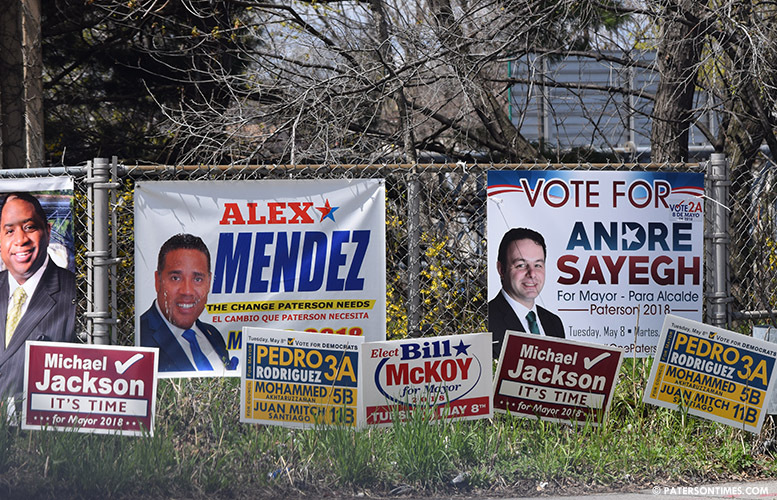 Campaign signs from Routes 19, 20, and 80 in Paterson were removed. Both mayoral and council at-large candidates have been plastering their campaign signs throughout the city. Some of these signs have been placed in prohibited spaces like abandoned buildings, government owned lots, sidewalks, and side of highways. “They are cleaning me up. Who is cleaning me up?” remarked mayoral candidate Pedro Rodriguez. He reckoned 2,000 of his campaign signs have disappeared from the highways. The state looks the other way when the signs are placed few days prior to election day, said longtime councilman William McKoy. “They give you some largess couple of days before the election,” said McKoy, who is running for mayor. “These guys don’t really know the rules.” He said this year, some campaigns have been placing their signs, without permission, on curbside lawns. Some of those signs have landed on roadways creating a dangerous condition. For example, signs with metal spikes are on the roadways of Union Avenue, Totowa Avenue, and several other streets. Councilman Andre Sayegh said there were some of his signs on the highways that were put up by some of his overzealous supporters. He said he is not too concerned about the state cleaning up the signs off the highways. Sayegh was more concerned about an Acura that has been driving around the city picking up lawn signs installed by his supporters. “I don’t appreciate people removing my signs from people’s properties. It’s happening right now,” said Sayegh. Former councilman Aslon Goow, who is running for one of three available council seats, complained to the New Jersey Department of Transportation about the signs. He also urged mayor Jane Williams-Warren to take actions against those putting up signs on public property, curbside lawns, and utility poles. The signs removed from the highways can be reclaimed by the candidates. “The signs are stored in the maintenance yard for 30 days and may be retrieved by the owners. After that time, the signs are discarded,” said Drucker. Rodriguez said his signs are expensive. He plans to reclaim his signs from the state. With all the trash on the streets, what's a bit more going to do? Who Cares? and that's why Paterson is a mess. Because people like you who come from other countries and who are brought up like scum. The old Paterson days it was much nicer and cleaner. Everything went to crap once we let you people in and created welfare. Excuse me, but who the hell do you think you are? You don't know anything about me and you are a first class creep to tell me that I can't post my opinions. I was born in NJ in 1954. (that's why the 1954 in peejay1954) Not some "other country". My dad was a factory manager in Paterson from 1950 to 1982. I've lived in Paterson in 1956 & 57 (and do remember it being a heck of a lot more attractive then, in my earliest life's memories) and from 2006 till now. I see this city now as filthy and corrupt and infested with crime. I go home, shut my door and ignore the crap going on outside my door. I'm not on welfare or take public assistance. I still work full time and I mind my own business. Besides, don't you recognize sarcasm when you read it?